Bus pick-up OUTSIDE 163 E. Pearson (SE side of Pearson and Michigan Ave). Chicago Crime Tours bus is red and yellow. Report 10 minutes early for check-in. Bus departs on time. Click TICKETS to view schedule. Last Minute Tickets: Call 312-888-6224 or buy from tour guide at bus. Advance reservations recommended. Overview: Escape into Chicago's underworld on a crime and mob tour with stops off-and-on the luxury, climate-controlled bus. 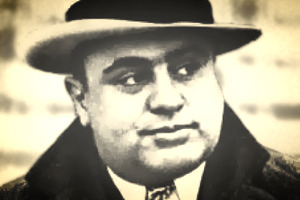 Some of the world’s most famous criminals, mobsters and gangsters bamboozled their way through Chicago. Explore several historic crime scenes by foot, including where Chicago gangsters John Dillinger and Hymie Weiss stood just before their deaths. Investigate Al Capone, The Untouchables, The Chicago Mob, John Dillinger, H.H. Holmes, Cap George Streeter, Frank "The Enforcer" Nitti, Leopold & Loeb, and more. See the site of the St. Valentine's Day Massacre, Chicago's most notorious murders. Stake out crime scenes like the Biograph Theatre, Holy Name Cathedral and other Chicago landmarks. Grab your camera for a drive-by shooting of the historic criminal courthouse, an architectural landmark where some of the most famous cases were tried. Explore crime scenes in Chicago's River North, Gold Coast, Lincoln Park, Old Town, Loop and Magnificent Mile neighborhoods. Overview: Light up the night on this longer version of The Chicago Crime Tour with more stops. This family-friendly evening bus tour illuminates Chicago’s crime, gangster and mob history under the cover of Chicago’s beautiful city lights. Meet guide OUTSIDE of Pizzeria Uno, 29 E. Ohio St.
Overview: Explore Chicago's crime and pizza history in the River North and Gold Coast neighborhoods. Family friendly walking tour includes pizza slices from Pizzeria Uno and Giordano's. Savor Chicago’s famous deep-dish pizza and uncover Chicago’s unsavory gangsters, criminals & mobsters.